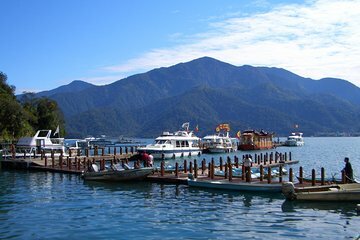 Explore the shrines, temples and pagodas of picturesque Sun Moon Lake on this 2-day coach tour from Taipei. You’ll stop at several temples on a walking tour of Lukang township. Listen to your guide’s interesting stories about this must-see Taiwan destination as you discover its various attractions. Overnight accommodation near Sun Moon Lake with breakfast plus round-trip transport included. Enjoy informative onboard narration while comfortably seated aboard your coach during this 2-day tour from Taipei. Your sightseeing itinerary includes stops at Sun Moon Lake, Puli and Lukang, with an overnight stay that includes breakfast. See the region’s stunning temples as you learn about the local culture of this scenic region. Note: Your tour may return to Taipei by train. Day 1: Taipei – Sun Moon LakeAfter pickup from your Taipei hotel, your guide will drive you to Puli in the county of Nantou. In your comfortable, air-conditioned tour bus, enjoy a drive through the town. Continue to the scenic area around Sun Moon Lake. Admire the serene views of boats docked by the lake’s pier as you hear stories about various local sites like Tehua Village, the local village of aboriginal people. Make short stops at Wenwu Temple, Tse-En Pagoda and Holy Monk Shrine, among others. In between sightseeing, your guide will make a lunch stop either in Puli or around the Sun Moon Lake area, and will give you suggestions for popular restaurants or local eateries where you can enjoy a delicious meal in the company of your fellow travelers (own expense). Day 2: Puli – Lukang (B)After breakfast, board the bus for a 1-hour (approx.) drive past small and big towns and valleys on the way to Lukang, a small urban township. Hop off the bus for a guided walking tour of the old town to visit extravagant temples like Tianhou Temple and Lung Shan Temple, both boasting a large number of halls dedicated to folk deities. Head back to Taipei either by the tour bus or by train (included). If your guide decides to take the train back, you will be driven to the Changhua Station to board the train. Once you arrive in Taipei, your driver will meet you at the station to transfer you back to your hotel. Sun Moon Lake is amazing place and Tony brought us to a beautiful temple and pagoda. I think we need more time to explore Sun Moon Lake by boat or take a ride with gondola so please take a note of my suggestion. For the time and distance traveled, the tour should have spent more time viewing the lake and more time visiting the aboriginal areas and its people. The places you visit are great and we never felt rushed. I have been an avid viator fan, since I first discovered it a few years ago. Compared to my previous tours booked through viator, this has perhaps been the only and most disappointing one - particularly for how much it cost to book this 2-day tour. All the places that we visited were essentially free to the public and no additional excursions were planned to enhance this experience. I could have just as easily booked a bullet train through the MRT in Taiwan to arrange my own transportation and booked a hotel for less money and still would have been able to visit all the exact same sights. I would consider expanding the options for this tour - such as arranging a boat trip, biking excursion, and/or meals at nicer restaurants. If meals are not going to be included in this tour as they were not, I would shave off some money on this rather expensive tour. It was certainly just okay and could have been a lot better. I would not recommend attending this tour unless some changes are made. Overall the tour was enjoyable and informative except for the visit to Stop at the Guangxing Paper Factory to witness the elaborate process of creating handmade paper. Our guide told us that it was not included in the tour. The Sun Moon Lake Hotel sitting on the edge of the Lake was peaceful and enjoyable especially in the evening and at night and the dinner food was above average. This was one of the best tours I took in Taiwan and am really glad I decided to do the overnight. The guide was very very nice and friendly and even allowed all of the members of the tour group to decide if we wanted to do a boat ride on the Sun Moon Lake which was a nice treat! I would have felt like my trip was not complete had I not gotten to do so!!! Great tour - we learned allot from our tour guide David. He was a very kind and informative tour guide and he even took our pictures for us. He was right on time for pick up and he answered every question we had. Sun Moon Lake made this tour worth it. The lake is absolutely beautiful, our tour guide let us take the boat from the other side of the lake and met us at the hotel, which was a great experience. The next day, we were taken to a couple more temples and was given some time to go shopping and walk around. We did not feel rushed at all. On our way back from Taipei we had not booked a hotel ahead of time, but David offered to help us find one until we were satisfied. We enjoyed this tour, but the only thing I would complain about is that we did not stop by the Guangxing Paper Factory. Thoroughly enjoyed this 2 day tour. I expected a big bus but it was just the 2 of us. The guide was knowledgeable and very friendly and his English was good. Amazing tour. Very lovely area. The hotel and city were a lot of fun. Nothing special about Lukang. They put you on a train to come back. Ours was delayed but they were waiting for us in Taipei. No problems. Well worth it and would definitely recommend it. For the limited time frame, I enjoyed the trip a lot! The hotel by the lake is absolutely beautiful!